We hope you will join us for a holiday gathering at the Thomas Cole National Historic Site in Catskill, New York. 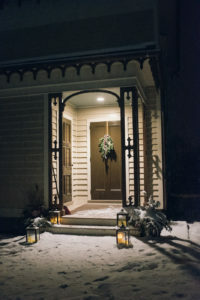 Enjoy festive cocktails and decadent hors d’oeuvres in Cole’s New Studio building and our first ever guided lantern tours of the 1815 Main House before proceeding on to a private dinner party in a beautiful nearby home. Cocktails & 7 pm Lantern Tours are still available. Dinner parties are sold out. This year, all ticket levels include our first ever guided lantern tours of the Main House. $500 Event Sponsorship includes two tickets to cocktails, a guided lantern tour, and a dinner party. 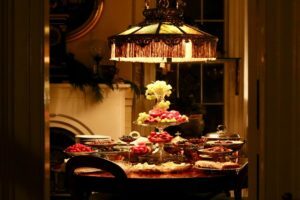 $145 per person – Cocktails, a guided lantern tour and dinner party. $45 pp – Cocktails, festive hors d’oeuvres and a guided lantern tour at 7 pm. Scroll down for online reservations. The event will support our 2019 special exhibition entitled Thomas Cole’s Refrain: The Paintings of Catskill Creek presented in partnership with Vassar College, Cornell University Press and the Hudson River Museum, with related programming in partnership with Scenic Hudson and Greene Land Trust. The exhibition curated by H. Daniel Peck, John Guy Vassar Professor Emeritus of English, will reveal new research on Thomas Cole’s Catskill Creek paintings and illuminate masterpieces from the New-York Historical Society, Yale University Art Gallery, and the National Gallery of Art.